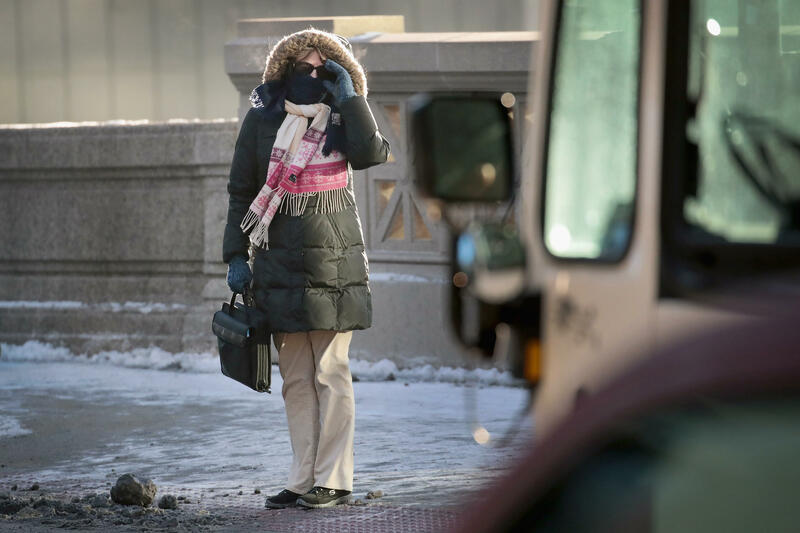 BOSTON -- The blast of arctic air that engulfed portions of the East Coast broke cold temperature records from Maine to West Virginia, stunned sea turtles in Florida, and was blamed for more than two dozen deaths -- but a warm-up was finally coming Monday. Two newly confirmed deaths in Chicago -- an elderly man who died of hypothermia and cold exposure and a 59-year-old man who slipped and hit his head, and then died of exposure -- brought the total death toll attributed to the cold snap to 26 early Monday morning across a vast swathe of the eastern United States, from North Carolina to Upstate New York. More than a dozen other deaths were suspected of having some link to the extreme cold, but the causes were yet to be confirmed. Burlington, Vermont, and Portland, Maine set records, with Burlington falling to minus 20, beating a 1923 record by a degree, and Portland recording minus 11, also a degree below a 1941 record. The National Weather Service said Worcester, Massachusetts, which fell to minus 9, and Providence, Rhode Island, which dropped to minus 3, also set record lows, as did Hartford, Connecticut, where the temperature dropped to minus 9, smashing a 1912 record. Boston tied a low-temperature record set more than a century ago in 1896 of minus 2. Record-low temperatures were also set in parts of West Virginia. The extended period of severe cold has begun to get on the nerves of even the flintiest of New Englanders. Evan Premo, of Marshfield, Vermont, stopped into a Capitol Grounds coffee shop in Montpelier for lunch Sunday with his two young sons, aged 5 and 3. "We've been stir crazy because we spend so much time outside always so yeah, it's a challenge," said Premo. Cleveland has also been dealing with two weeks of frigid temperatures. Arthur Bassett, who manages a coffee shop in downtown Cleveland, said Sunday the cold temperatures are what people in northeastern Ohio have come to expect. "Clevelanders have toughness engrained in them," Bassett said. "You deal with this." The good news is the bone-numbing air is set to push out of the region. By Monday, Boston temperatures should return to a more seasonable low 30s. The mercury will continue to rise and Boston could see temperatures in the mid-40s by Thursday and as high as the low-50s on Friday. Many Northeast residents endured jaw-clenching temperatures and brutal wind chills over the weekend as cleanup continued from the storm that dropped as much as 18 inches of snow in some places on Thursday. As aviation crews at South Carolina's busiest airport, Charleston International Airport, struggled to clear runways of snow and ice so they could be reopened, in New England water main breaks, frozen hydrants and burst pipes created new headaches for officials. The temperature registered minus 37 Saturday at the Mount Washington Observatory in New Hampshire, one of the coldest places on the planet. The wind chill was minus 93. It tied with Armstrong, Ontario, as the second coldest spot in the world. Meteorologist Mike Carmon said people at the observatory were "layering up as a much as we can." The chilly winter blast did not spare Florida, where rescuers rushed to save hundreds of young sea turtles stunned by the cold. State wildlife officials said they had rescued more than 100. The Gulf World Marine Institute in Panama City Beach said it had treated 200 turtles by Thursday evening. In New Jersey, George Jenkins was working Sunday morning to get rid of some stubborn icy spots on his driveway of his Toms River home. "The ice usually isn't a problem here at the (Jersey) shore, because it usually goes away a day or so after a storm. But it's been so darn cold lately, I can't get rid of it," he said. And in Atlanta, forecasters warned a mix of low temperatures and precipitation could create icy road conditions there, where the College Football Playoff National Championship will be held Monday night. Traffic is expected to be heavy as thousands of out-of-towners converge on the city and as security is tightened for President Donald Trump, who is scheduled to attend the big game. Some of those benefiting from the deep freeze are hardy diners hoping to land a table at Boston's hottest restaurants. Owners told the Boston Globe that reservations have been down with fewer patrons willing to suit up in layers of clothes and shiver on sidewalks waiting for a table to open up.